Our tour guide from Italian Days Food and Wine Tours was far too cheerful for such an early start. We had been picked up at seven in the morning—before sunrise in mid-January—and denied even a cup of coffee before leaving. Our hotel’s breakfast only started at seven, so we had run downstairs and grabbed a roll. The van driver had glared at us and told us we were not allowed to eat in the van. An hour later we met Fabio, who would be our guide for the day through the wonders of Bolognese traditional food manufacturing. Fabio is short and stocky: his face, framed in a close-cut beard, matching the square shape of his body. His wide grin was contagious, and despite our general sleepiness and lack of caffeine, we cheered up. Piling out of the vans—two vans, filled with travel and/or food bloggers and their friends, plus one chef from the US—hilarity followed as we squirmed our way into the required paper gowns, hats and shoe covers in the cold morning air. We still felt caffeine-deprived, but as Fabio explained the outlines of the process of producing Parmigiano Reggiano cheese, his enthusiasm was infectious. It was also cold at that hour of the morning, which kept us moving. Each vat extends another meter or so into the floor, and produces two rounds of cheese twice a day. 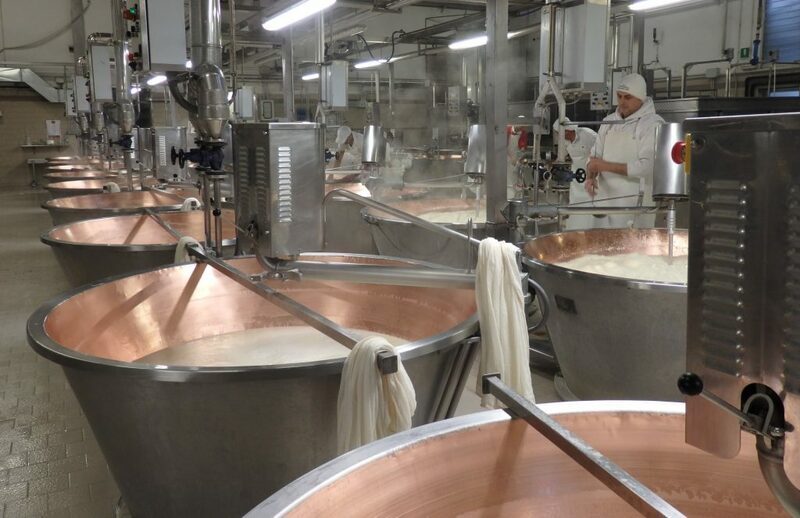 The curds form into a huge lump, and the factory workers use long sticks to fish the lump of cheese out of the bubbling whey. We watched as they cleanly cut each lump in half using a length of wire, and wrapped each half in a net. Workers wrap the lump of curds in a net. In this way, each vat produces two rounds of Parmigiano cheese, each weighing about 38 kilograms (83 pounds). We were guided through the rest of the steps with detailed explanations along the way: the brining process, in which the cheese, now shaped into wheels, spends a month or so submerged in salt water; and the aging process, in which it simply sits, being turned regularly and checked to see if it is developing bubbles (not good). I was amazed at the sheer size and expense of those rounds of cheese. There’s a reason Parmigiana is so expensive. A quick check on Amazon shows me that I can order my very own entire wheel of Parmigiano-Reggiano cheese for just $2788.88 (plus shipping charges)! We finished the tour with tastes, of course. 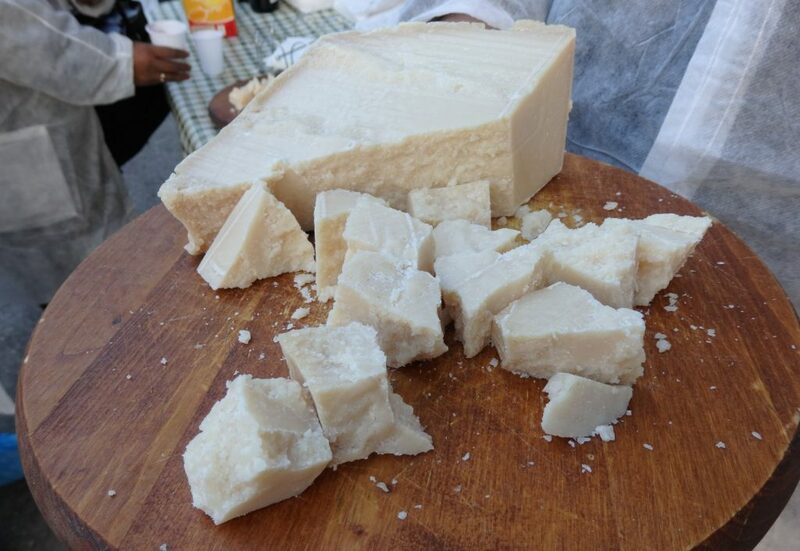 First, a 13-month-old cheese (mezzano). 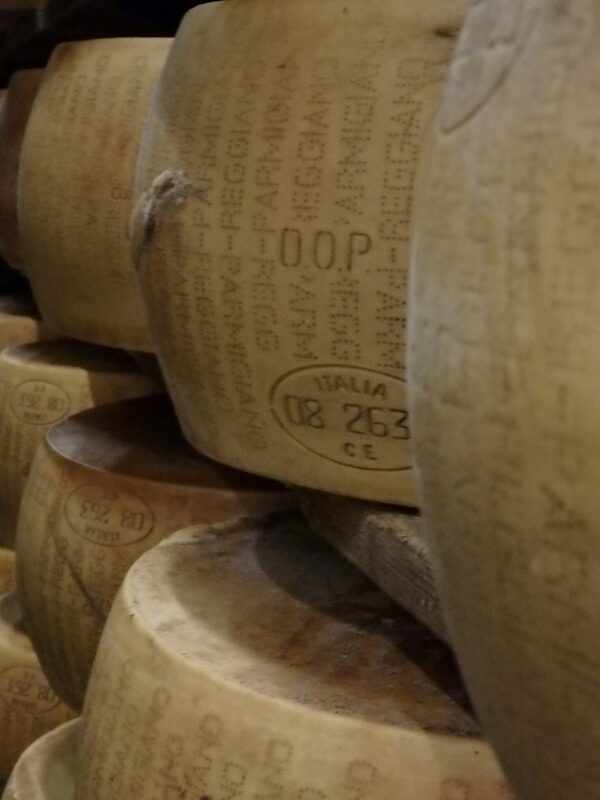 This is considered lesser-quality because it has developed too many air bubbles in the first year of aging, so it cannot carry the Parmigiano Reggiano title. Nevertheless, it was delicious. And we tasted the 25-month-old Parmigiano Reggiano itself, which tastes distinctly stronger and has a crumblier texture than the mezzano. Frankly, I liked the mezzano better. The rest of “breakfast” certainly helped make up for the lack of caffeine: sandwiches of mortadella cheese, slices of delicious sausage, and truly decadent donuts. A glass of wine may have been completely inappropriate at that hour of the morning, but it improved our mood immediately. Piling back into the vans, a short drive took us to the next stop on our Italian Days Food Tour: a balsamic vinegar producer. I was surprised to learn that what I had always known as balsamic vinegar is, according to Fabio, fake. It’s mixed with 80% regular wine vinegar, which is why it tastes sour like most vinegar. Real balsamic vinegar is made from Lambrusco and Trebiano grape must: pressed grape juice which has been cooked for 24 hours. The real vinegar has only that ingredient. After cooking, it is stored to ferment in wooden barrels in attics, where it is cool all winter, but the summer warmth reactivates the yeast. Barrels used to age the balsamic vinegar. The cloths over the openings are there to keep flies out, I assume, and the stoppers hold the cloths in place. We visited the attics of the producer we visited and saw how the barrels are arranged by descending size. The barrels—which can be centuries old—all have a small opening for air on top, and the vinegar naturally reduces through evaporation, so the barrels don’t stay full. Once a year, after the grape harvest, the smallest barrel is refilled from the next biggest barrel; that barrel is topped off from the next biggest, and so on. Newly cooked grape must is added to the largest barrel. The biggest barrel smells more like wine than like vinegar. The smallest smells like vinegar. The barrels aren’t just for storage: each is made of a different sort of wood—oak, juniper and so on—so the year that the vinegar spends in each also affects its flavor. This process goes on for 12 years or for 25 years. As you can imagine, 25-year-old balsamic vinegar is not cheap! I was surprised, when we received tastes at the end of the tour, that it isn’t at all sour. It is thick, like syrup, and a bit on the sweet side. One of the tastes we received was a small amount on a bit of vanilla gelato, and the combination was unusual but tasty. According to Fabio, only about 5700 gallons of real balsamic vinegar are produced per year, while five million gallons of the fake are produced. Italian Days Food Tour’s next stop was a prosciutto factory. Prosciutto is made from the back legs of pigs, which are water-cured and then salt-cured. This factory also produces parma ham, San Daniele ham, and some sort of a sausage eaten in the region at new year: pig innards boiled in leg skin. As you can imagine, we were relieved not to see the whole process; instead we started with enormous drying and curing racks full of legs. It’s still not for those with weak stomachs or vegetarian tendencies. There’s a lot of meat on view in this factory. Again Fabio was very detailed and enthusiastic in explaining the process of producing the meat: the three months necessary for drying, the eleven months necessary for aging. He showed us how the meat gets salted and refrigerated and re-salted and re-refrigerated to remove all the moisture. He showed us how layers of pork fat with rice flour and pepper are added to protect the meat. He also pointed out the connection with the Parmigiano cheese factory: for real Parma ham, the pigs have to be fed the whey that is left over from Parmigiano cheese production. 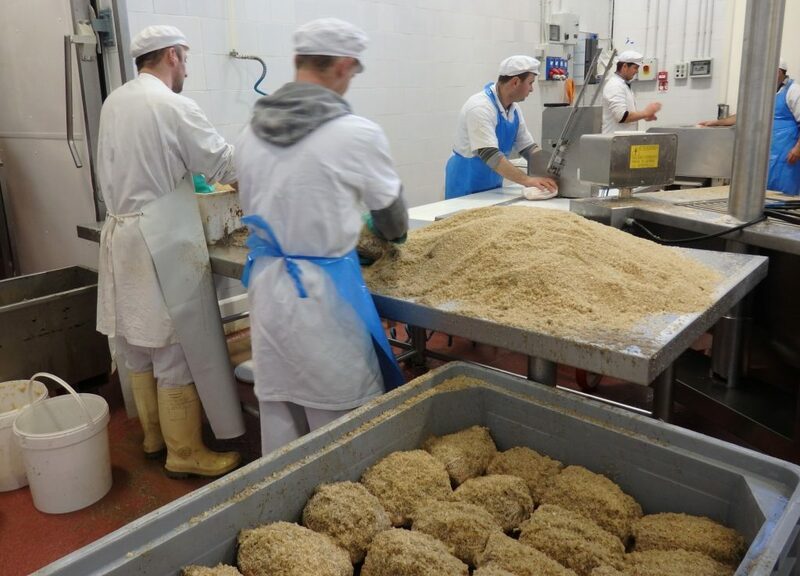 The workers in the back are putting the meat into nets. The ones in front are covering and packing the netted meat in salt. After this factory visit, we were again offered tastes, this time in vast quantity: a whole table set with nothing but bread sticks, a sparkling white wine and sliced meat of various varieties. It was nearly lunch time, so we dug in happily, only to discover that this was, in fact, not lunch. It was just a “tasting,” apparently. Our last stop was a restaurant, where we enjoyed an array of local specialties accompanied by more wine. Fabio played host, making quite sure we all had far too much of all the delicious foods on offer. It included a traditional tagliatelli Bolognese; a tortelloni dish; passatelli, a wonderful worm-shaped pasta I had never seen before; and a couple of heavenly desserts. Passatelli was my favorite dish of the meal. While I enjoyed this tour enormously—Fabio is wonderful!—I would certainly not recommend it to anyone who doesn’t eat meat, or pork, or who is a vegan. You would not enjoy anything but the vinegar tastes, and even those were served on milk products. For anyone else, this would be a fun way, especially with a group of friends, to learn more about the local specialty foods by seeing the factories in which they’re made. Disclosure: This tour was provided for me for free by Italian Days Food Tour and arranged for me by Hotel Touring. All opinions, as always, are my own. Great post! Brings back a lot of good memories. Thanks so much for taking me with you. Thanks, Shobha! It was fun, wasn’t it? What did that cheese factory smell like? I can’t even imagine… I’ve also heard that people who work in vinegar factories are super healthy and live long lives due to the health benefits. Did your guide mention anything like that? I suppose balsamic vinegar might be different than regular vinegar? It smelled cheesy, of course! And the prosciutto factory smelled meaty and the vinegar factory smelled like wine more than anything else. The guide didn’t mention anything about vinegar and health, as far as I can remember. Vinegars are different because of what they’re made from and how they’re fermented and aged. Balsamic is made only from Lambrusco and Trebbiano grapes and aged in this particular way. So much food. It would be good to know up front how much food was coming so you could pace yourself! It IS a food tour, so I should have guessed! Bologna is such a foodie heaven it must have been fabulous to see how the main players products are made. It is definitely a town I must go back too! I’m not a foodie, but found this tour fascinating. I don’t usually think much about how the food I eat is produced, so this was an eye-opener! Despite starting your day without coffee and a surly driver, it looks like it was a great success! As a city girl who grew up with all her food wrapped in plastic I find it fascinating to see how it grows (plant or animal) is cooked, fermented or processed. And all the tastings … mmm! 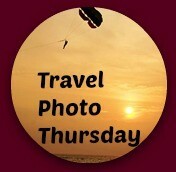 This post has me thinking about a visit to Italy as well as signing up for some food tours! The driver lightened up later in the day. Maybe he snuck some coffee while we were inside! What an interesting tour this was. I especially enjoyed reading about the making of balsamic vinegar. I will be reading the labels of balsamic vinegar now to see how real or fake they are. The real thing should only list the grape must, and it’ll look quite syrupy in the jar. And it’ll be far more expensive than the others! Look at all that gorgeous food! I’m British and have never been to Italy, can you believe it?! (When something’s so near, you tend not to visit, which is a shame). I love Italian food though and it makes sense to eat it in its home environment. And that food tour made my mouth water! There are plenty of cheap flights to Italy these days and it’s SO worth a visit! You won’t want to go home! We did a food tour, walking tour, with a tourism rep in Bologna, and it has to be one of the best travel experiences we ever had in Italy. . .but then again, Italian food is some of the best to be had, so I guess I shouldn’t have been as surprised as I was. Your post made me lust for some pasta! That was a great tour. I felt like I was with you…..including feeling desperate for a cup of coffee before leaving. I would have died. I can’t believe you could buy the cheese through Amazon. Too funny! It was also interesting reading about Balsamic vinegar. I had heard that a lot on the market is fake but was surprised how little of the real stuff they produce. No wonder it’s so expensive. I don’t drink coffee, but I was missing my morning tea, and I hate skipping breakfast. The others in the van though, including the driver, were clearly missing their coffee! Oh yum. Just. Yum. I can’t even begin to describe how much I love food tours like this one. The cheese process is fascinating and I had no idea you could even get 25 year old balsamic. Perhaps like fine wine, it ages well. And the lunch? OMG. Haha! I had never been on a food tour like this before, where you visit the producers, but I’ll certainly look for them in future! Wow, that’s a lot of cheese! Good thing there was prosciutto to go with it. Loved learning that they feed they left over whey to the pigs. And it was literally millions’ worth of cheese stored in that aging room! Even though I’ve been to Italy many times, I still very much enjoyed reading about the region as I like cheese and “exotic” cold cuts. What a fantastic tour you had and interesting story. Your post took me along from my chair so all I missed were the tastings. Since I was recently in Italy, I know how fabulous those are. Thanks for sharing. Food tours like these make the traveling experience so much more robust. You really took me there with you I could almost smell the cheese! And that shot of the passatelli made me hungry instantly, well done! I think there is no better food in Italy than the food in Emilia Romagna! This looks like a great tour.